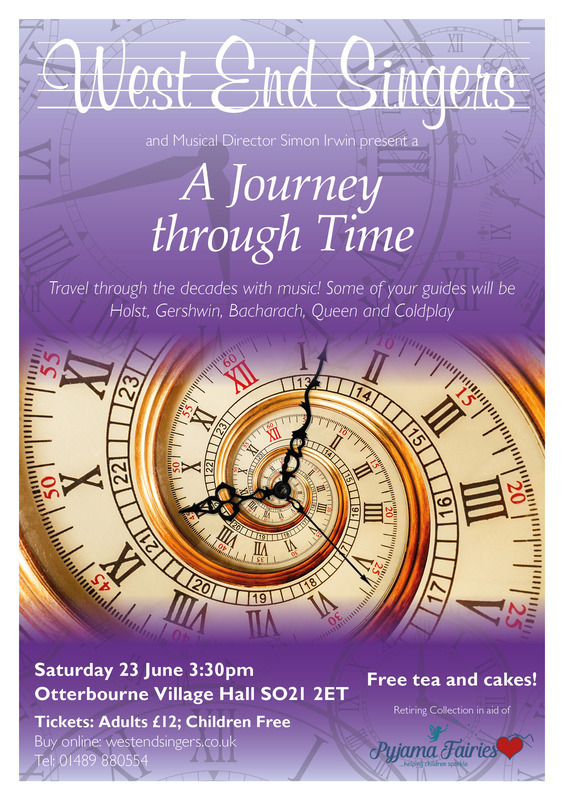 West End Singers and Simon Irwin invite you to a choral Journey Through Time on the afternoon of Saturday 23 June, at Otterbourne Village Hall. An informal celebration as we make our way through over a century of music! Featuring traditional, modern, and classical music from the 19th Century through to the 2010s; with music from Holst, Pergolesi, Gershwin, Bacharach, Coldplay, Emeli Sandé, and more! Homemade cakes (included in the ticket price) and Pimms await you! We are returning to Otterbourne Village Hall for the third year in a row as it’s the perfect place for our summer celebrations: a large hall with lots of natural light, indoor and outdoor space, ample parking on-site, and a kitchen/bar. If you wish to make a booking by phone or talk to someone about your booking, please phone 01489 880554. Alternatively, if you have a query that can be answered by email, contact tickets@westendsingers.co.uk. Please note that as we cannot accept payment details by email, bookings must be made either online through Yapsody, by phone, or in person. There is a small booking fee, solely in order to cover our payment processing costs. This year we are proud to support the Pyjama Fairies, a Hampshire-based charity that aims to bring comfort and support to young patients and their families in hospitals in the UK by creating and distributing beautiful pyjamas and surgical gowns that give children an emotional boost and remind them that they are not defined by their illness.